If you look out of the campus-side windows in Franklin Dining Commons after the sun has gone down, you can see a mix of white, blue and magenta lights illuminating the inside of the Clark Hall Greenhouse. These lights mark the home of the UMass Hydroponics Farm Plan, where Dana Lucas, a junior sustainable food and farming major, and Evan Chakrin, a nontraditional student in the Stockbridge School of Agriculture, have been working throughout the winter growing fresh leafy greens. Back in December, the duo received a $5,000 grant from the Stockbridge School of Agriculture to grow produce year-round on an on-campus hydroponic farm. Hydroponics, a method of farming with water and nutrients in place of soil, allows for a continual harvesting cycle. Along with limited pesticide use and saving 90 percent more water than a traditional farm, the farm will produce approximately 70 heads of lettuce a week, every week of the year. Lucas and Chakrin emphasize the importance of this perpetual cycle in meeting the University’s sustainability efforts. “I don’t know how we can say our food is sustainable at UMass if it’s only grown 10 weeks of the year in New England,” Lucas said. The location allows UMass Hydro to get their greens across campus by either walking, biking or driving short distances, leaving almost no carbon footprint. “I think this is something that really excites me and Evan because we really see a demand for fresh, local food and this is a way to actually fulfill it,” Lucas said. Although the farm’s production capacity cannot currently meet the needs of the dining halls, Lucas and Chakrin are looking into alternative options to get their greens on the plates of students. “We’re kind of just centering on student businesses right now because they’re smaller and they’re run by our friends, so we can easily get into the market,” Lucas said. Their first official account is with Greeno Sub Shop in Central Residential Area. Last week, Greeno’s hosted a special where UMass Hydro’s microgreens were free to add to any menu item. Chakrin and Lucas are currently working on getting their greens served at other on-campus eateries. In addition to adding more accounts, there is a strong focus on getting other students interested in the emerging field of hydroponics. “We can use this as a teaching facility for students. The techniques we’re using are used in multi-acre industrial greenhouses for lettuce, so we could scale right up potentially,” Chakrin said. The two are hoping to work UMass Hydro into the curriculum in Stockbridge, allowing students to work hands-on with the systems while also earning credits. “Maybe we can do a one credit, half semester thing or something,” said Chakrin. 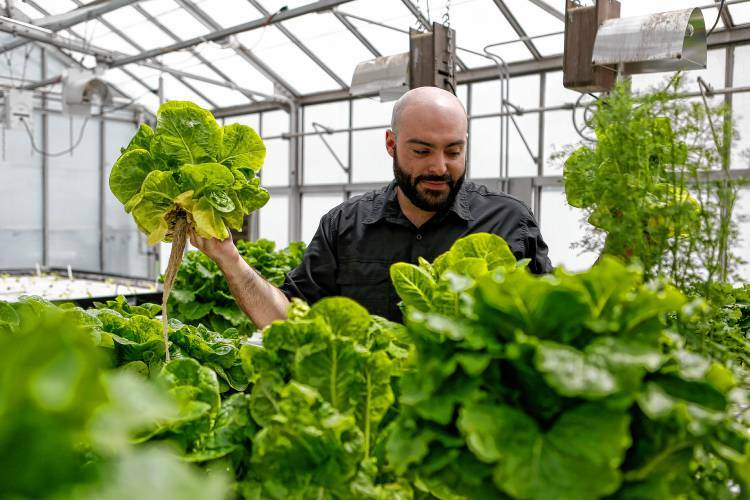 “There has been some discussion about having an accredited course for next fall where we can teach what I’m assuming are mostly going to be Stockbridge students, but we’re open to anybody and everyone who’s interested in getting involved with hydroponics,” Lucas said. The grant covered the cost of seeds, equipment and other miscellaneous items like scissors, but the responsibility of building the farm fell entirely on Lucas and Chakrin. “It felt really cool that we were given this much responsibility I feel like, to just buy the stuff and then build it,” Lucas said. Chakrin noted how one of the biggest obstacles faced in getting the project off the ground was finding an available space on campus. 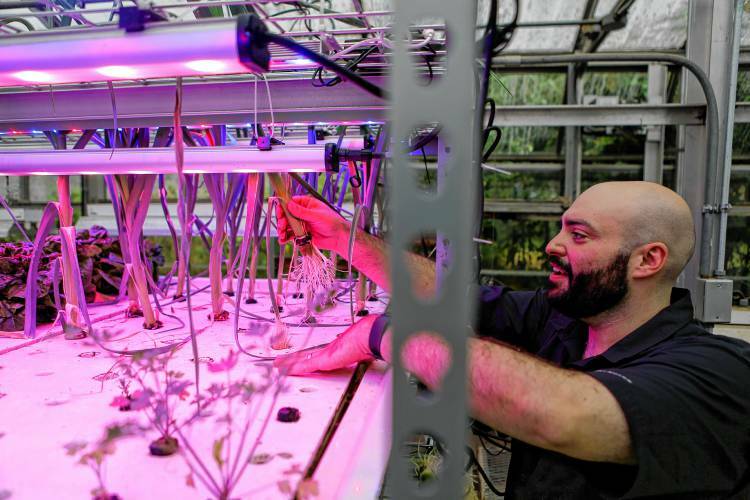 “Initially we were just asking for a 10-by-10 closet somewhere, then Stockbridge professor , Dr. Dan Cooley, was like ‘Do you think this greenhouse will work?’ and we were like ‘Of course!’” Chakrin said. “He kind of posed it as a bummer that we weren’t going to be in a closet and we were like ‘No, no, no that’s fine!’” Lucas said, laughing. “Without the space, none of it would be possible, so being allowed to use this space is just huge and we’re so lucky to have that,” Chakrin said. The students also expressed appreciation to Dr. Daniel Cooley, who sponsored the project and Dr. Stephen Herbert for his support and donation of supplies. Out of the entire space granted to UMass Hydro, only a portion of it is currently being used. In order to make use of the underutilized space, Chakrin and Lucas are hoping the future of UMass Hydro involves more funding. 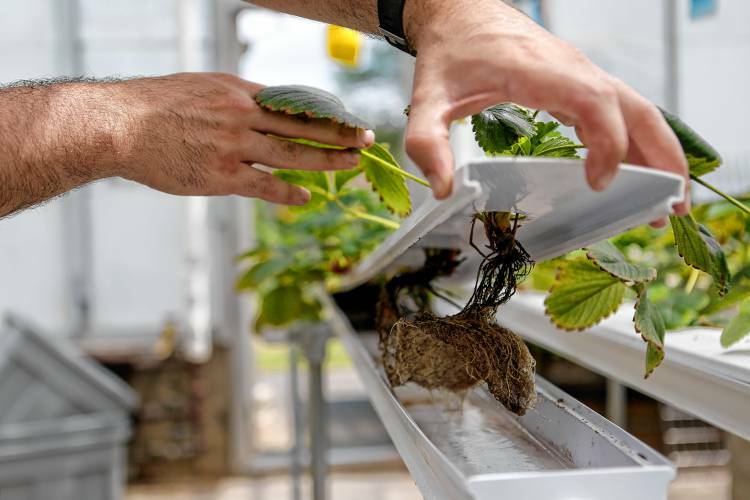 “We want to see Dutch buckets and a vertical system in here so we can show students the breadth of what you can do with hydroponics,” Lucas said. Visitors are encouraged to stop by at the Clark Hall Greenhouse on Tuesdays between 3 p.m. and 7 p.m. And you can follow the project on Facebook at UMass Hydro! Callie Hansson can be reached at chansson@umass.edu. The following excerpt was taken from conservative blogger, Gracy Olmstead, writing about how a “bust” in the farm economy might open up opportunities for a more sustainable food system. The full article is published here. The negative impact of industrial agriculture on environmental quality and social justice is well recognized. Industrial agriculture however has been justified by an assumed positive impact on the economy. This article questions that assumption. For more on industrial agriculture and the sustainable alternative, see this list of books used in classes offered by the UMass Stockbridge School of Agriculture. Did you know that over 65% of the recent graduates of the Sustainable Food and Farming major in the UMass Stockbridge School of Agriculture are women? Drawing on 10 years of research and work with women farmers, the Rise of Women Farmers and Sustainable Agriculture, published in 2016, explores the societal changes that have empowered women to claim the farmer identity, describes barriers that are broadly encountered by women farmers, and offers a framework to shift the US food system to one that better supports women farmers. Soil Sisters, also published in 2016, provides a blue-print for women who want to farm. Author Lisa Kivirist, founding coordinator of the Rural Women’s Project of the Midwest Organic and Sustainable Education Service, synthesizes key information and advice from seasoned women farmers committed to sustainable agriculture. Pioneer Valley is home to food entrepreneurs! NUTS…. There is a small farm, community based alternative to the dominant vision of industrial agriculture feeding the world. 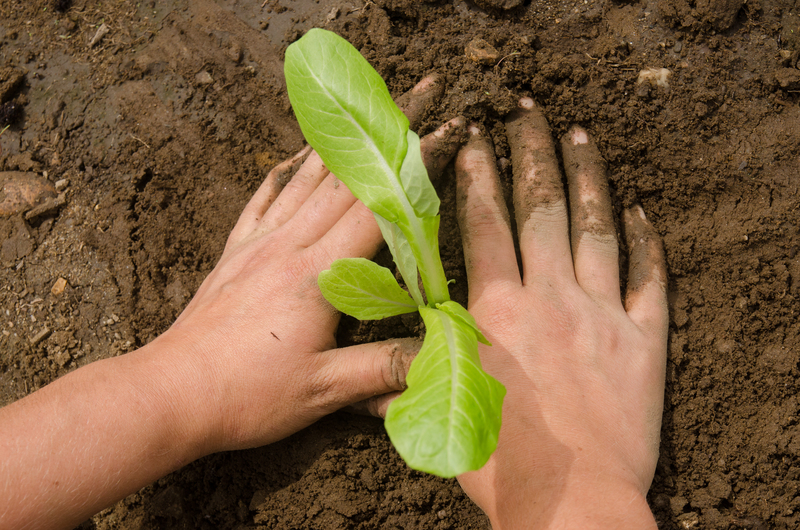 Come to learn and grow with us in the UMass Stockbridge School of Agriculture! American food writer MFK Fisher once said, “First we eat, then we do everything else.” Food is central to so much in our lives – family, health and community. But what about the food we don’t eat? More than a billion tons of food is never consumed by people; that’s equivalent to one-third of all food the world produces. What many people may not know is that one in nine people on earth don’t have enough food to lead an active life, or that food loss and waste costs the global economy $940 billion each year, an amount close to what the entire UK government will spend in 2016. They may also not know the incredible effect food loss and waste has on the environment. 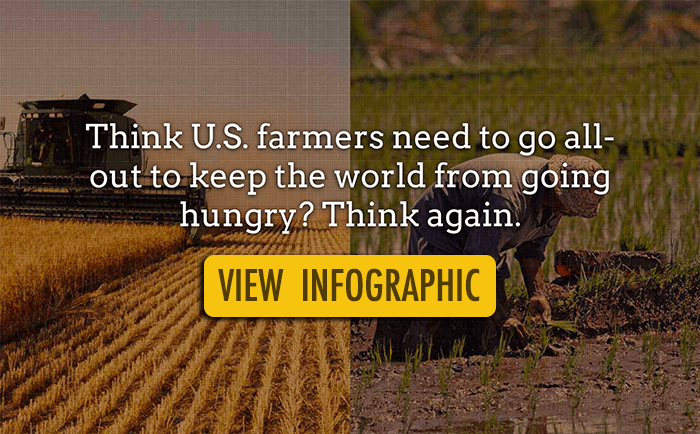 Eight percent of the greenhouse gases heating the planet are caused by food loss and waste. At the same time, food that’s harvested but lost or wasted uses 25 percent of water used in agriculture and requires cropland the size of China to be grown. What an incredibly inefficient use of precious natural resources. When you look at the kind of impact food loss and waste has on our environment, economy and society, it’s clear why the United Nations included it among the most urgent global challenges the Sustainable Development Goals would address. Target 12.3  of the goals calls for nations to “halve per capita global food waste at the retail and consumer levels and reduce food losses along production and supply chains, including post-harvest losses” by 2030. It’s certainly an ambitious challenge, but it is also one that’s achievable. This week is Climate Week, an opportunity to take stock of where we are on critical environmental issues like food loss and waste. A new report  on behalf of Champions 12.3  – a unique coalition of leaders across government, business and civil society who are dedicated to achieving Target 12.3 – assesses our progress so far. 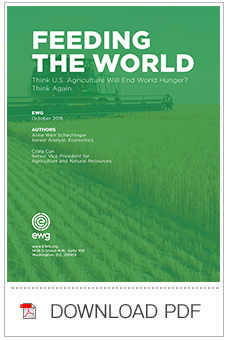 The report details a number of notable steps that have happened around the world, including national food loss and waste reduction targets established in the United States and in countries across the European Union and African Union. It also highlights efforts to help governments and companies measure food loss and waste, such as the FLW Standard  announced in June, and new funding like the Danish government’s subsidy program and The Rockefeller Foundation’s Yieldwise , a $130 million investment toward practical approaches to reducing food loss and waste in Kenya, Tanzania, Nigeria, the United States and Europe. There have also been advances in policies as well as education efforts like the Save the Food  campaign to raise awareness of food loss and waste. The progress is promising. But the report also notes that the action does not yet match the scale of the problem, and much more work is needed worldwide if we are to successfully meet Target 12.3 in just 14 short years. While the magnitude of the food loss and waste challenge can seem daunting, I know from my own experience in the United Kingdom  that progress can be made if you have the right levels of engagement and commitment, and an understanding of the size of the problem and where to focus. In a period of five years, we managed to reduce household food waste across the UK by 21 percent. It’s an impressive figure, but there is still so much more to do! Targets: Food loss and waste reduction targets set ambition, and ambition motivates action. I know targets were important in the UK. We didn’t know exactly how they would be achieved at the time they were set, but the very existence of a reduction target helped drive innovation. Measurement: What gets measured gets managed. Right now, too few countries and companies measure the levels of food loss and waste inside their borders or supply chain. The report recommends governments and companies quantify and report on their food loss and waste and monitor progress over time. Without this kind of knowledge and data, countries and companies don’t know what they should focus on or where to target their efforts. Measuring food loss and waste also helps make the impacts more tangible. Throughout the employee line and within households, there is just not enough awareness of the issue generally, nor its implications for wasted money, wasted resources and wasted opportunity. Action: Impact only occurs if people act. Governments and companies should accelerate and scale up policies and practices that reduce food loss and waste. We need greater sharing of examples of what works and what doesn’t work, as well as learning from others’ experiences. This is so important. We can’t just let everyone go through the same learning curve. If the world can pay as much attention to all the food we don’t eat as to the great culinary trends of the day, we will build a food future that can sustain generations to come. I’m optimistic that we will achieve this. It won’t be easy, but the stakes are too high to miss our chance to create monumental change. Why the “food movement” is unstoppable..
…there are profound reasons why the food movement is succeeding and growing. The philosophy of the food movement goes even further, by recognising that our planetary problems and our social problems are really the same problem. The food movement represents the beginnings of a historic ecological and social shift that will transform our relationships with each other and with the natural world. Join the Food Movement and create a career as a Sustainable Food and Farming major in the Stockbridge School of Agriculture at UMass Amherst.